Artist's rendering of how the Dominion Brook Bridge was to look. 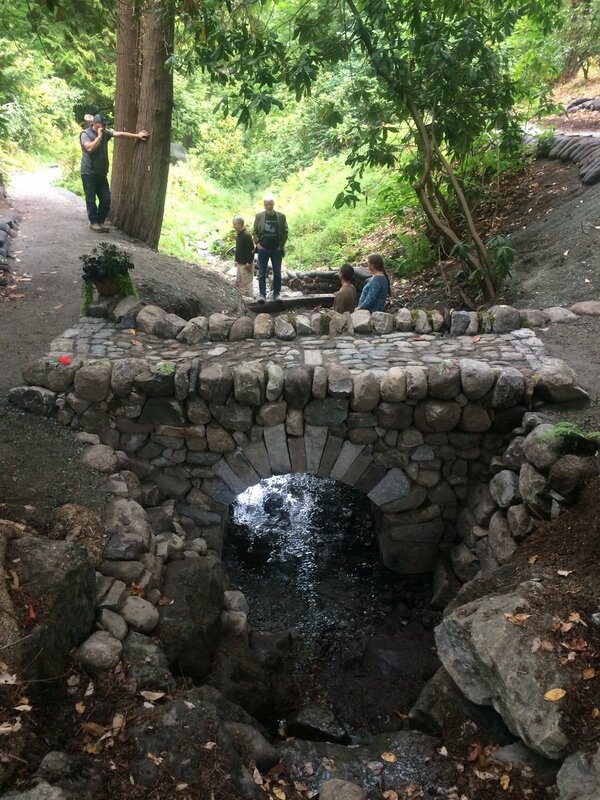 The Dominion Brook Bridge project was run by DSWAC (Dry Stone Walling Across Canada) as an eight day dry stone walling workshop open to anyone who wished to learn more about building beautiful practical structures of stone without mortar. The course consisted of on-site hands-on instruction under the direction of John Shaw-Rimmington ( with two fully trained assistants) where students completed an 8 foot span, 16 feet long, four foot wide, dry laid, traditional style, Scottish packhorse footbridge, constructed using a variety of local very random natural stone material . I thought about how the two landscape 'features' had now joined to have a beautiful life together. The happy union of brook and bridge would go on to be a blessing to all those who came along their path. It's interesting that the wedded couple are in a relationship where neither one is there to be an obstruction to the other. Both allow for, and respect, the other's 'flow'. Both have the freedom to go in a direction that maintains natures harmony and compliments the other. The meeting of the two is a place of blessing because it is crossing over, a spanning of differences as well as a meeting of the elements. Stone and Water. It will be a place where new and wonderful things will be conceived. A place where dreams come true - a marriage of human skill and natural design which will have hopefully come together to bring out the child in all of us.